Looking for a way to give your back to school supplies a personal touch? You can add a one-of-a-kind touch to your supplies with embroidery! 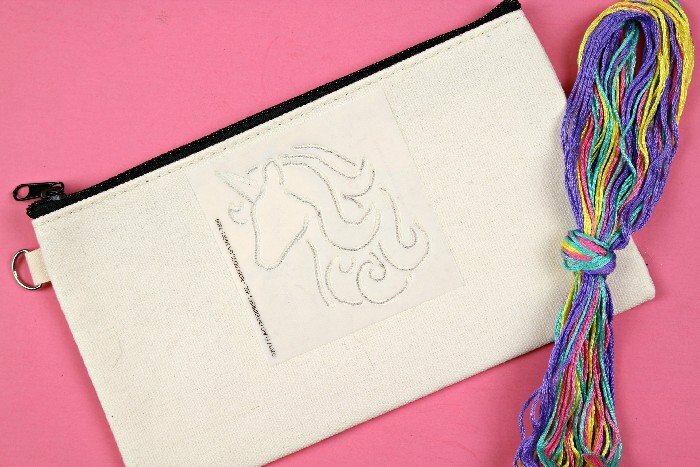 I created this adorable embroidered unicorn pencil pouch with a kit from Bucilla. 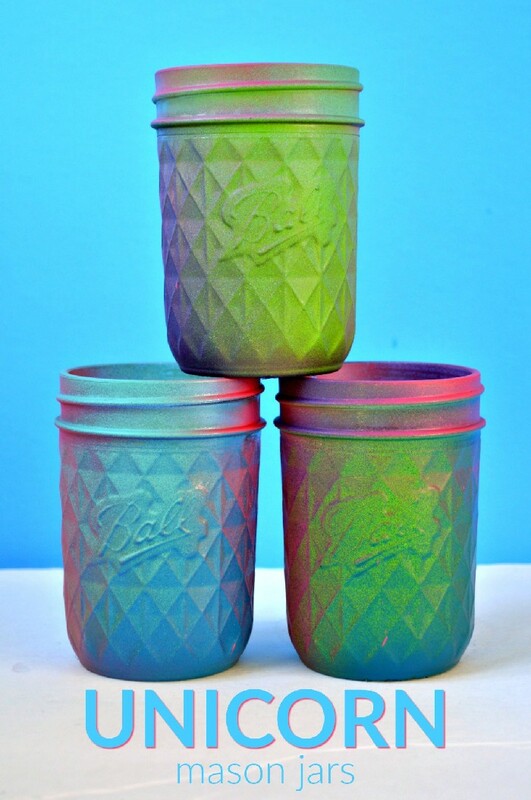 Plaid did send me this kit to try out, but this is not a sponsored post. 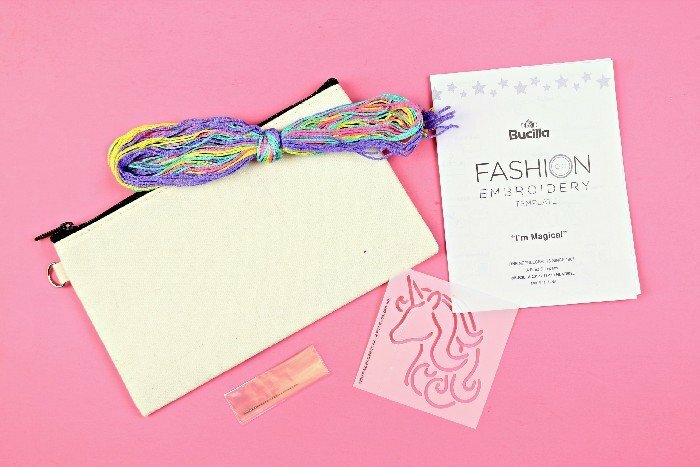 The Fashion Embroidery kits come with supplies to embellish your project with the designs contained in the kit. 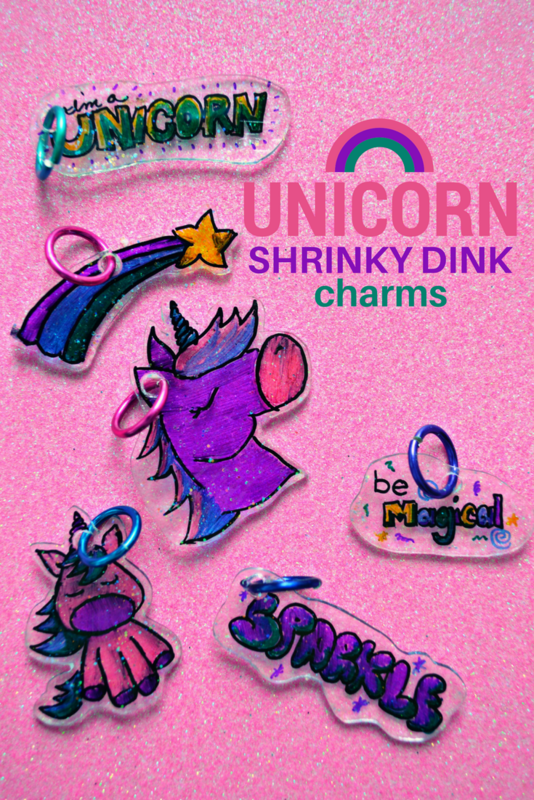 I used the “I’m Magical” kit which includes adhesive templates for a unicorn design, a rainbow design, and an “I’m magical” design. The kit also comes with embroidery floss. an embroidery needle, and instructions. 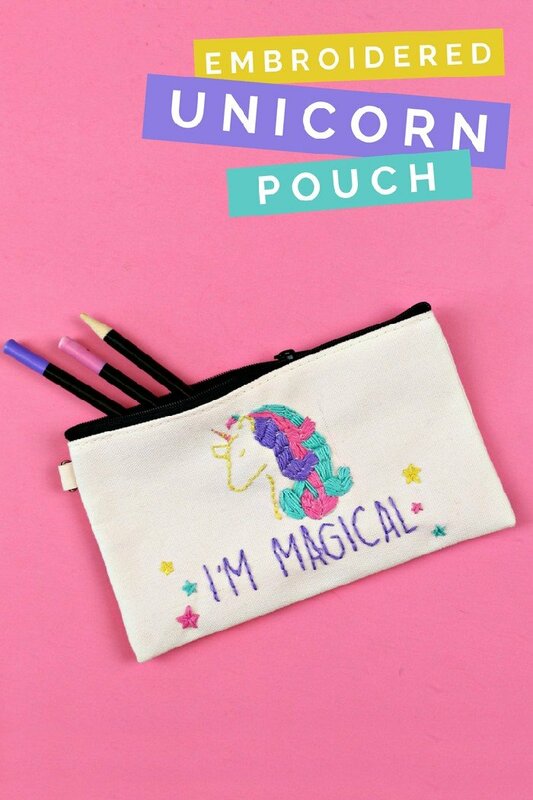 I chose to use both the unicorn and the “I’m magical” templates for my pencil pouch. 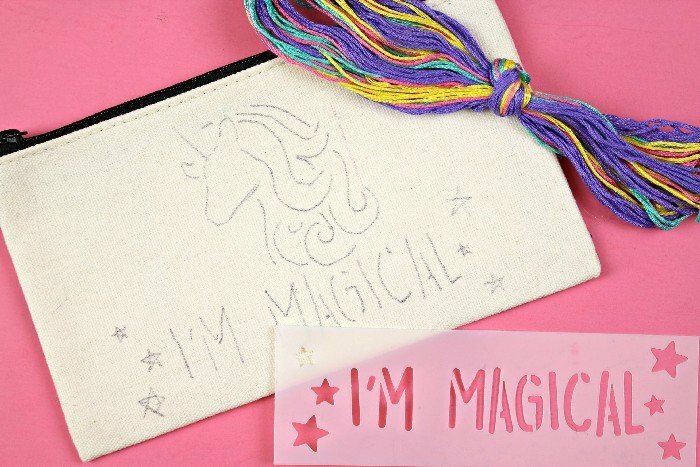 First, I centered the unicorn on the pouch, and traced it with a water-soluble pen. I repeated the same process with the second template. The kit has instructions for several different embroidery stitches (which I promptly spilled my LaCroix on). I mostly used the Back Stitch for my pencil pouch, although I did use a small version of the Fishbone Stitch for the stars. 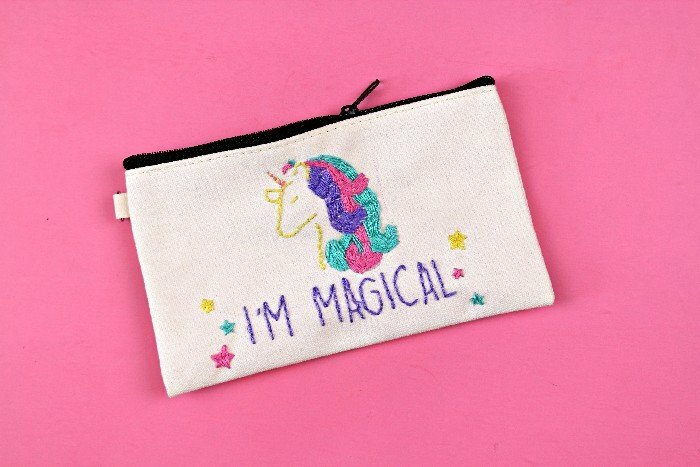 I spent the afternoon stitching up the unicorn pouch. It is not perfect in any sense of the word, but I think it’s pretty good for someone who hasn’t done any needlework in years. 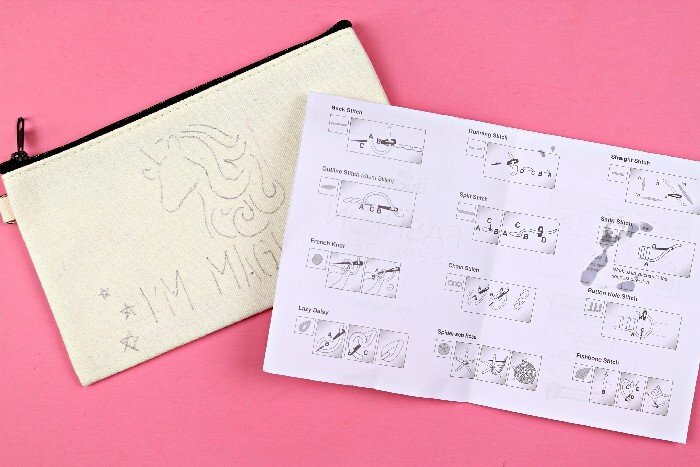 The kit makes designing the project super simple, and the instructions are a great resource learning different stitches. Such a great idea and pencil pouch. Loved this post. Thank you so much.